So You Think They’ve Got Talent? Every rabid tennis player thinks their little munchkin might be the next Serena Williams or Novak Djokovic! Or maybe you just want to have some fun, quality time with the fam. Either way, before you go down that road…here’s a bit of advice. Never force a child to play or practice. Both of you will be miserable. Just encourage them to have fun and everyone will be happy. Now with that said, let’s talk about how to start your child off in tennis the right way. First, your little one needs a tennis racquet! One they can pick up and swing and that’s not going to be yours. 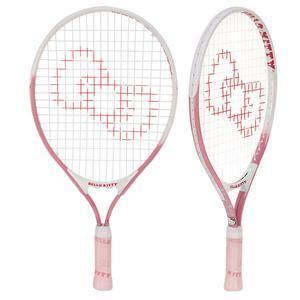 If your daughter is into pink or cartoon characters consider a 19″ Hello Kitty or a Wilson Dora The Explorer themed racquet. They are light enough and short enough for a 5-6 year old. Of course she’ll want a matching bag. Hello Kitty Bags come in pink, red or white. Or Babolat makes a Girl’s Backpack that will hold her racquet and balls or water bottles. 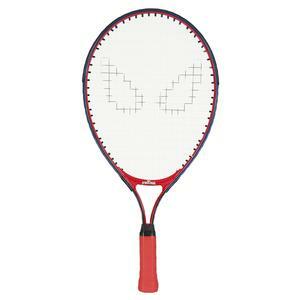 For little boys, consider the Marvel Spider-Man 21″ Junior Tennis Racquet or the Wilson Spongebob 21 Junior Tennis Racquet. All junior racquets come prestrung and are inexpensive as they will out grow them quickly. All junior racquets come with a cover, but he may want a a backpack to carry his racquet and water and snacks. 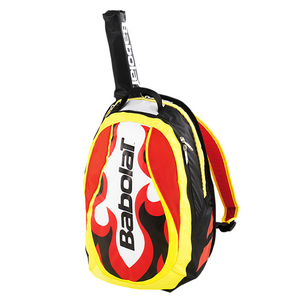 The Babolat Boy’s Junior Backpack is perfect for all his needs. Next you’ll need some oversized foam balls for some underhanded pitches so they can work on their eye-hand coordination and contact with the ball. 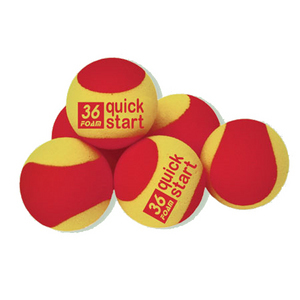 The Quick Start 36 Foam balls are softball size so they can have a better chance of making contact. Try to encourage a sideways stance to the ball and the low to high follow through if possible. As they progress, you might want to add a net to your routine. The Gamma First Set 36′ Tennis Court Kit is a perfect starter kit for any youngster looking to get into the game in a big way. 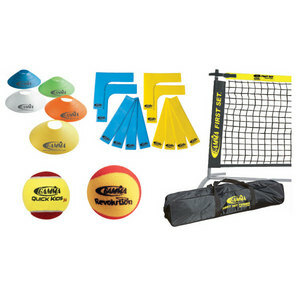 Conforming to the USTA Quick Start tennis program and ITF Stay n’ Play guidelines, the Gamma First Set 36′ Tennis Court Kit includes 1 18’ First Set Jr. Net, 2 Revolution Foam Balls, 12 Quick Kids 36 Tennis Balls, 12 Court Marker Lines, 5 Disc Cones. When they master a few basics, they might need a target to try and hit. 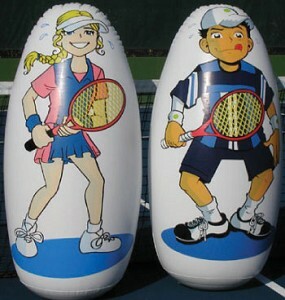 The colorful Oncourt Offcourt Tennis Knockdown Targets feature water-filled bases. Knock them down, and they pop right back up for more. Lots of fun and a great way to teach them how to move they ball around the court. Can’t get to the courts and you’ve had enough of your future star hitting against the garage door or that brick wall around back? 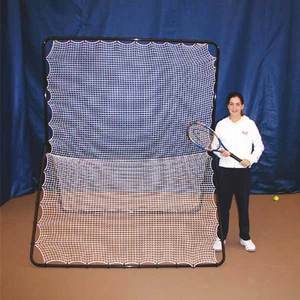 Consider a net that can be set up in the garage or on the driveway. The patented Rebounder is just what you need. Two players can hit on either side at the same time. Practice ground strokes, high volleys and overheads from across the net into the lower angled section. It can be used in a multitude of games for all sports. Once they are able to rally at the courts, you definitely will need a lot of balls to practice with. Save your back for your own game and buy a ballhopper. The Oncourt Offcourt MasterPro 100 Ballhopper comes with a higher-gauge material on the handles and floating arm for extra stability. 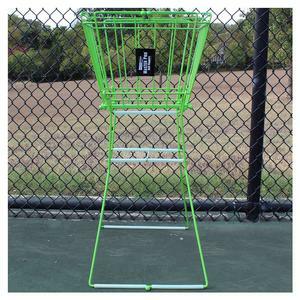 A double-door style lid was added so that the lid can be open when picking up balls. Start closer to the net and toss the ball underhanded. As they have success hitting the ball over the net, have them stand closer to the baseline. So now you believe they really do have potential. 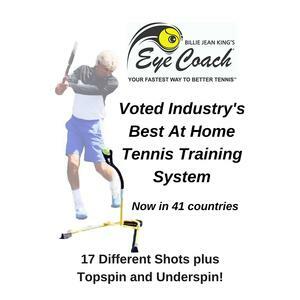 Give them the Billie Jean King Eye Coach Pro Model Tennis Trainer. It is the fastest way to better their tennis! With homework assignments covering Technique, Control, Timing, Power, and Live Play, they can improve their game in just 10 minutes a day in the comfort of home! Watch the video attached to the website to see how it works and all the various strokes that can be improved. As your future star becomes more interested in the game, you might consider lessons from a real pro….not just you! You don’t want them to fall into bad habits that may be hard to break. You can find group and private lessons at many public courts or private tennis clubs. Again, remember it’s got to be fun for them to want to continue. Good luck and hope to see them at Wimbledon some day!